Thanks to everyone who helped to make the 2018 Sale a record breaker. At the time of writing you have helped to raise over £130,000 before costs. 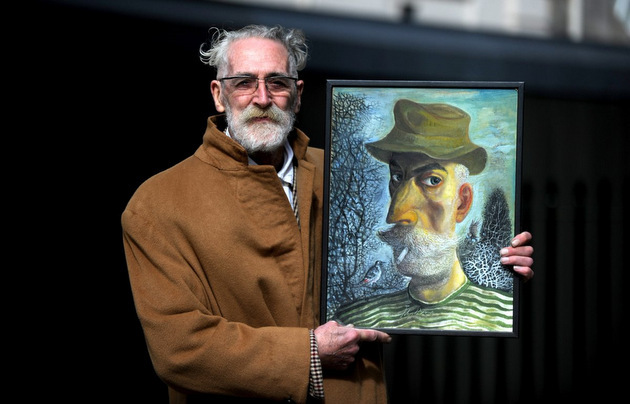 2018 Patron John Byrne generously donated a self portrait to the sale – sold by silent auction on the first day. The Sale of Pictures and Scottish Books took place from 26-28 October 2017, and raised over £13,000. 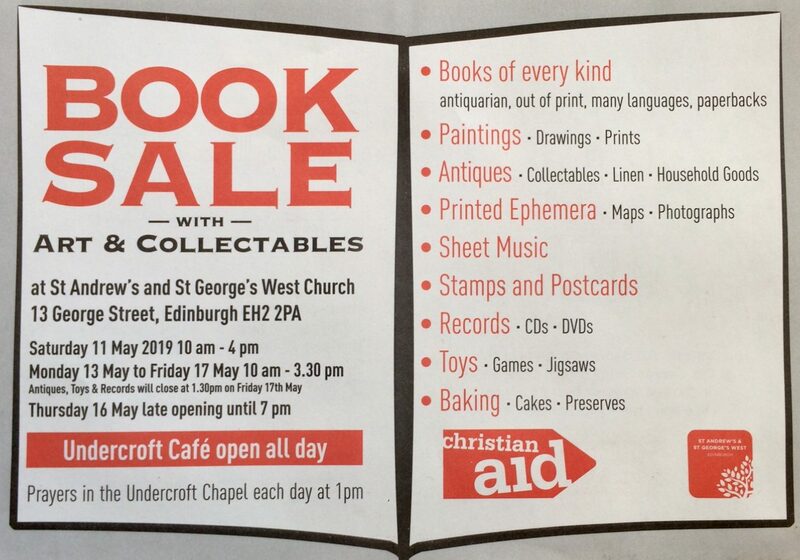 Since it started in 1974 the Sale has raised over £2m for Christian Aid’s work to end poverty. 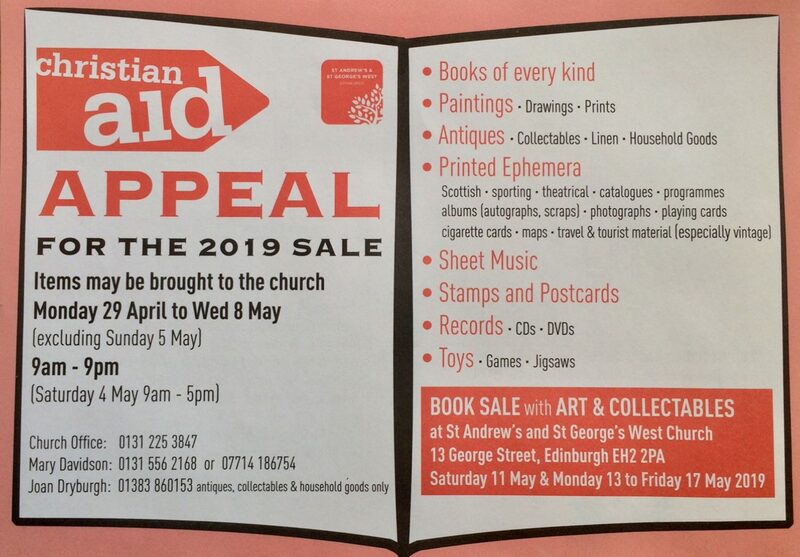 Over 500 volunteer helpers from Edinburgh and beyond work together to create the biggest fundraising event in the UK for Christian Aid. 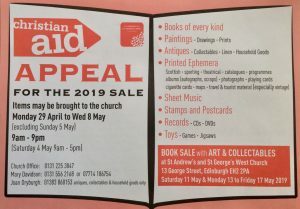 The Sale is held annually, in May, in Christian Aid Week when thousands of churches and individuals throughout the UK devote the week to fundraising for Christian Aid to tackle poverty, and the causes of poverty, throughout the world. 100,000 books of every kind fill the Sanctuary and both courtyards. But there’s much more than books … upstairs in the gallery you’ll find sheet music (and more books!) downstairs in the Undercroft Café you’ll find a gallery of pictures as well as delicious homebaking and food to sustain you. Head through to the Davidson Room hidden at the back of the church and you’ll find a treasure store of antiques and collectables. 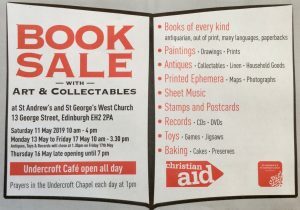 And did we mention toys, records, stamps, postcards and ephemera?